After Nick Clegg produced the best performance in last night’s ITV debate, it is time to examine their manifesto. Others has so far failed. John Redwood attacks the £5bn hole in the Lib-Dem figures, but misses the more important bits. Brian Barder on LabourList has clearly not read the Manifesto and Tom Harris thinking that the policies are irrelevant. However, the manifesto is significant for anyone (like me) sad enough to read the thing. In detail it is a direct appeal to the Liberal Left. It is far more re-distributive than Labour, whilst also scrapping some of Labour’s more authoritarian policies like the ID cards. – In the army, reducing the top brass to fund increased pay for the lower ranks. – Anti tax avoidance measures. – Hitting big business with higher corporation tax. – Devaluing the Nations investment in the Banks by a banking levy; by breaking them up; through state sponsored competition in the form of a PostBank; and a UK Infrastructure Bank (high interest safe returns for “green investment”). – Cancelling a replacement fo the Trident nulear missile system. They say they will look for cheaper alternatives, but this is unlikely to happen soon with even bigger cuts in other areas necessary to pay it. Added to this the fact that Labour have created a structural deficit that will undermine public spending for a generation, and you have a strategy to overtake Labour as the party of the left. Perhaps it is Nick Clegg’s strategy to emphasise this in the third debate when Gordon Brown thinks he will avoid Clegg’s criticism. Mark Reckons on Nigel Farage on Drugs Policy. – Why mainstream politicians will not back an open discussion. John Redwood on Can Labour End it’s War on Business? – As a way of diverting from Labour’s involvement in the current crisis. John Redwood on Are Christian Country? – Christ dying so that we might be forgiven is the central message. Watered-down implication is that we recognize our mistakes, say sorry and move on. Perhaps the biggest risk we are facing is with the foreign purchase of our National Debt. The resulting high value of the pound would further erode the ability of our exporters to compete. Also, if the deficit is not brought under control we may not only have to pay higher interest rates, but issue debt in other currencies, to protect the lenders against any weakness in the pound. Then we will be like the emerging economies in the 1980s and 1990s. John Redwood wonders when the Labour Party will stop attacking business. Not this side of the election and perhaps never is the simple answer. This war with business started with blaming the banks for the current crisis. In the Labour view their wild excesses created the crisis, and so must be now tightly regulated to prevent this happening again. Once you go down this route, it is only a small step to saying that all business is only beneficial to the general welfare if tightly controlled. To go back on this might be to admit that the banks were not entirely to blame for the crisis and the mounting debt. Allow this chink in the anti-bank defence, and the debate in the general election campaign will be as to how far the tripartite structure of central banks, regulatory authorities and government policy was to blame. The further stage is then to lay bare how poor the state of the government finances were during the boom years. That is, through creating an ever-increasing structural deficit when at least budget balance should have been attained. 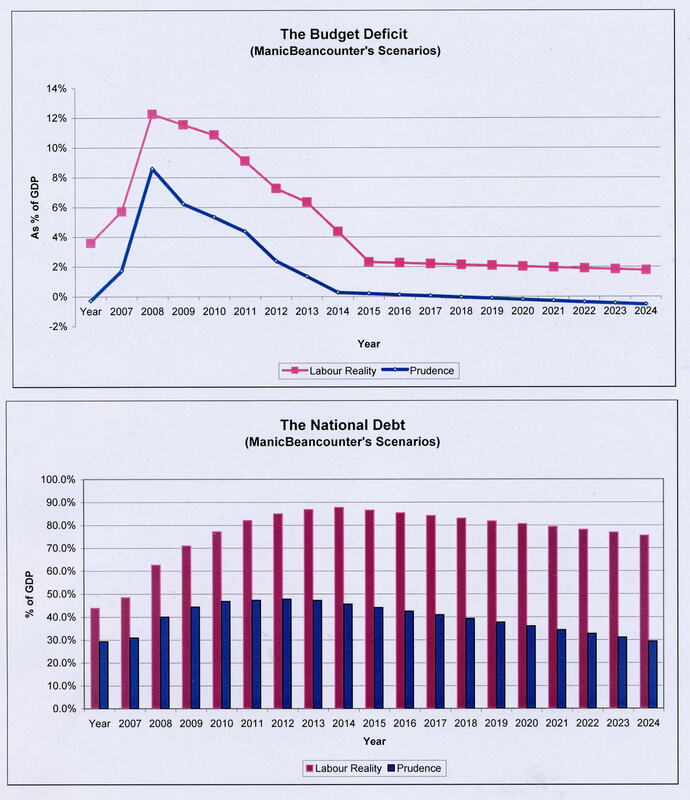 By my calculations about half the forecast National debt of £1400 billion in 2014 will be down to economic mismanagement since 2001. During the forthcoming election campaign I expect a constant barrage of attacks on bankers in particular and business in general. The hope from the spin doctors is that people will be distracted enough not to look at the true causes of the current crisis. If the Labour party – the self-proclaimed defender of public services – were to admit that they have wrecked the public finances for a generation, the party would implode. If they have any let-up on the business-bashing, then Gordon Brown will end up with a bigger defeat than Michael Foot in 1983. Stephanie Flanders, on her BBC blog Stephanomics, can often provide thoughtful comments on the UK economy. Yesterday’s blog, “Cameron’s Nixon Moment” is anything but. Whatever the rights and wrongs of the arguments that SF later presents. There is a double meaning. The superficial one. Nixon’s claim that he was not a crook worked against him. So will Cameron’s denial that he is not a recovery-wrecker. There is no distinction made between the political realities (don’t frighten the voters) and the economic realities of doing what is best for the country. This is a tightrope all political parties are walking. With an election looming, the leaning is towards the political side. Any impartial analysis should recognize this. An impartial economic analysis should recognize the real risks that the economy is facing. Most of the growth since 2001 has come from two sectors on the output side – the State and the financial services sector. Neither will contribute much to the recovery. In the expenditure side, much of the boom was debt financed – both consumer spending and Government spending. The flexibility of the UK economy has diminished in the past decade due to increased regulation. The growth will be slow from other sectors. Due to the high levels of debt, the recovery is at the mercy of interest rates. A modest rise could reverse the recent house price rises, and could add to the cost of servicing the National Debt. If the deficit is not tackled we could pass a tipping point. Every higher national debt will lead to higher interest rates, which will increase the debt, leading to higher interest rates. The only way out will be to have the IMF impose a solution. That will cause short-term intense expenditure cuts and tax rises. There may then be a long period of reduced growth the pay off the debt.